It’s still so hot that the lizards need to cool off in the shade, so take care! 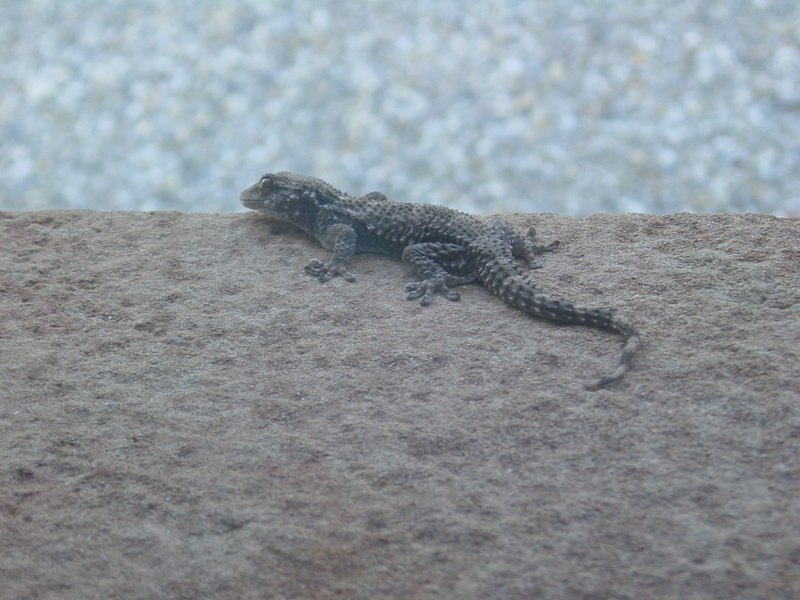 This lizard was lurking on the windowsill on the shady side of the house yesterday. We’ve been having very loud thunderstorms almost every evening. I hear that my friends in England are getting a lot of storms and rain as well. We’ll all need these soon! The thunder has been so loud some of the time that you can feel the sound vibrating through you. That’s when the cats come and sit really close to me, if the bipeds are busy. The cats know I’ll look after them and protect them. I look after everyone in the household – I am the chief of security. My ancestors were bred to protect flocks in the mountains, so it’s my heritage. My friend Flea at Jones Natural Chews wrote about the Great Pyrenees, or Pyrenean Mountain Dog, last week and she gave lots of good information and concluded, quite rightly, that we are not the dog for everyone. So I thought I’d tell you a little more about some of the things that mean we’re not right for everyone. We’re often accused of having selective hearing and a very unreliable recall. I have to admit that’s true for a lot of us! It isn’t naughtiness, it’s a case of priorities. However well-trained a Pyrenean Mountain Dog is, our priority is to protect you, so if we hear a strange noise we’ll be off to investigate. We’ll do all that other obedience stuff to please you, when we’re not too busy! We’re also accused of being escape artists, especially during adolescence. If we’re alone in the garden for even a few minutes, it needs to have a strong fence at least 5 feet high. If we can get over, or through, the fence we’ll probably take the opportunity to check out the surrounding area and make sure there are no threats. I took advantage of the gate being left open for a few seconds once – I didn’t get very far, but that’s another story! Dogs who are always taken in the car to the park and never walked from the house are particularly determined to explore the neighbourhood. Flea mentioned how important socialisation is for us. It’s a crucial part of our development because it’s what helps us to be relaxed and calm as adults. The more experiences we have, the better able we are to make sensible decisions. My bipeds say that I could be like Dr Jekyll and Mr Hyde as a puppy during training sessions. I quickly became bored, if we were only doing things I thought I already knew how to do. And when I was bored I wasn’t very nice to know! My bipeds spiced up the sessions with new tricks to keep my interest and they became better at noticing the first signs of boredom. A Great Pyrenees doesn’t do something just because you say so. We need to feel it’s worthwhile and I don’t just mean treats – we don’t tend to be as motivated by food as a lot of dogs are. There were days when I would put a lot of effort into trying to find ways of not doing what I was asked to do. On the odd occasion I avoided doing something, I thought I didn’t have to do anything I was asked to do. I would lead them a merry dance for days! I certainly did my best to keep my bipeds on their toes, while I was growing up. They say that there were times when they were pulling their hair out, but I’m much nicer to know now! How would the Pyrenees handle the coyote packs? We have big packs that are out of control. Would one dog be overwhelmed? I am not prepared to get a dog now, but will in the future when we stop traveling so much. We have nine acres, and six foot fences. My thought is that no single dog can handle the packs without risk to the dog. Two pyrenees would be A LOT of doggie!! I have a friend who lives on a compound with two wolves nearby. They are the only canine I have seen handle the coyotes although, many people out here have pyrenees or mastiffs, so they can possibly too. It’s hot out here in the summer, but my dogs play outside, and live inside and are inside at night when the packs are most active. I have no direct experience of coyotes and I hear differing stories of how determined they are. Some people say that they will move on if they come across a large dog and others say that they will lure a dog out into the middle of the pack and kill the dog, but I haven’t seen any stories of them killing a Great Pyrenees. I have seen many people saying that the Great Pyrenees is more than capable of running coyotes off their property. I’m fairly sure that two dogs could cope, but I can’t really answer the question of whether you actually need two dogs. I think you need someone who understands the behaviour of the coyotes in your area and also knows how a Great Pyrenees works to help you decide that. If you have trouble finding someone drop me a note and I’ll see if any of my contacts can help you find someone who can help. The first Great Pyr I met was one of a family of three. We have coyote packs here in Oklahoma, and the woman the Pyr belonged to had poultry covering several acres. The Pyr were there to protect the birds from the coyotes. She’d had them for a long time and said they did a great job at keeping the coyotes away. They fought with them. It was a mother, father and son set. I don’t know about it packs, but I can’t imagine that many poultry wouldn’t attract packs of coyotes. You do sound like you were a little head strong when younger Clowie! Good thing you bipeds picked up on your boredom quickly. I have to admit, I was quite opinionated! Stubborn is another word I’ve heard a lot. They say they find me quite easy to live with now I’m grown up! Hi Mollie, I don’t think there’s anything wrong with selective hearing! We stand about 6 feet tall if we stand up like a biped, so we can haul ourselves over a low fence if we want! Stay dry and keep cool! I’ll do my best, you too! It’s great to hear more about you Clowie……I think you’re a “whole lotta dog” but so beautiful and smart too. My Mom says I have very selective hearing but certain words I ALWAYS hear but I suppose all of us are like that to some degree!!! All I know is that I’m very happy to be your friend…….. Thank you, Sammy! I’m very happy to have you as my friend. My breed become lovely dogs when people understand us and work with us, but we’ll always have minds of our own. I still have selective hearing especially when I’ve found a scrumptious morsel but there’s no way I could jump that high – impressive! I don’t know what bipeds have against selective hearing! It’s usually more of a scramble and a flop over onto the other side than an actual jump – we are quite tall when we stand on our hind legs! Really enjoy learning more about your breed first hand (guess that should be first paw), Clowie. The only Pyrenees I’ve met have been working dogs who were raised with sheep and lived with the sheep full time. A very different life than yours. I’ve often wondered what it would be like to have one as a family pet and how those guard dog duties would translate in a family environment. Thanks! Most of us are a bit of a handful as pups and in adolescence. But if we get enough socialisation and training we’ll make a great job of keeping an eye on our household – and be a lovely companion. Treats are all that matter to me. Mom says if I ever get tired of treats, she’s in trouble. She says I will be a loose cannon. That’s good…. Right…? I don’t see how it can be a bad thing, but it doesn’t really matter as long as she keeps giving you the treats! You are so similar to my Kuvasz sister! She made my mom cry a lot when she was a puppy! Her independence was taxing on Mom but she loves her and enjoys the challenge most of the time. Your breed is wonderful but not for the light hearted owner! Now that Katie is 11, she has gotten much more trustworthy but is still apt to take off on a whim…just not as far or fast! Pyrs, Kuvasz, that whole family of breeds are wonderful. I think I’d get on very well with Katie – we agree on all the important things. I’ve heard my bipeds say that they think they could cope with most dogs after surviving my puppyhood – I take that as a compliment! Do you know Jasper and Nellie? [http://jaspersdoggyworld.wordpress.com/] They are Maremmas and they are very similar in lots of ways. We not only had selective hearing we were well naughty too Clowie. It took us some time to train our peoples. We had the mother of all hail storms yesterday. The garden is a mess. Hope your storms stop soon. Have a wonderful Wednesday. Training bipeds takes a lot of time, Molly. Hail storms do make a mess! I hope your weather improves. Have a great day! I’m a “don’t leave-him-unattended-in-the-backyard”-dog too. But I will work to get a selective hearing – my staff says that would be a substantial progress :o) I’ve read that only ONE of your ancestors was enough to protect a whole castle or manor. Not bad huh? My biped laughed about selective hearing being an improvement! Yes, my breed was very popular with the French nobility for guarding their homes. One of the reasons was that if we’ve seen people come to the house, we’ll allow them to do so again and only alert to unusual things. A lot of the specialised guard dogs won’t allow anyone to approach. Yes, he did! Queen Victoria also had a Pyrenean Mountain Dog. I think us dogs are just misunderstood. We beagles have a trait called “willfulness” and we too like to escape our gardens and sniff out the whole neighbourhood. You never know where a rabbit might be lurking. I think the bipeds just need to know that we’re thinking about a lot of things and there has to be a purpose to all these tricks that they want us to learn. We’re busy dogs with purpose! Yes, I think we often are misunderstood when we’re just doing what our ancestors were bred to do. Bipeds seem think we should be waiting to see what they are going to ask us to do, when we have so many much more important things to take care of! Stay cool, lovely photos! Great follow up to Flea’s breed profile. They sure are lovely dogs. Thank you! I think I turned out well in the end, but they were quite pleased when I grew out of the awkward stage! My 2yr male is in that stage now. The antics are funnier when you look back on them than they are at the time! Most Informative Clowie Post ever ………. Thank you very much! I’m glad you liked hearing more about my breed. I was like a rebellious teenager as a pup! We all need to think for ourselves sometimes! It’s too easy to do what’s expected of us and miss out on exciting things. Yes, and I think you two have found the right bipeds for you! My former neighbor had two dogs just like you. I lived next door when the old one was alive and he was fairly mellow and sweet. After he passed on, she got a puppy. OMG! He was jiving all over the place. Lovable and sweet but he would bound over into my yard whenever he saw me and knock me down to give me kisses. Took a lot of training to get him somewhat under control. You are a beautiful wonderful breed! Yes, we have so much weight to throw around while we still have a puppy’s brain! It’s hard to imagine how different a puppy can be from the calm and relaxed adult version, until you’ve seen it. Hope those scary thunderstorms leave you alone soon! I don’t want to see you with webbed feet! I think bipeds have strange ideas about “selective hearing”! 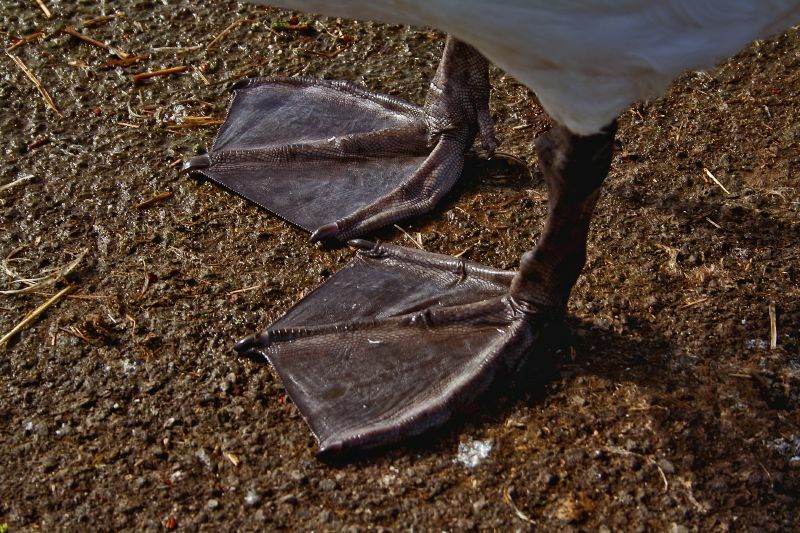 I would look strange with webbed feet! I wish more people were this honest about dogs. Often, we hear people try to simplify that Newfs are just black Great Pyrenees (or vice versa), and I don’t think that does a service to either breed. In my experience, where Newfs may be more aloof (a training challenge in itself), GPs can sometimes be a little bit more… mischevious, maybe. I agree with you about how important socialisation is, and it’s especially important for any of the giant breeds. We all benefit from early training – we get big so quickly! I have often heard people telling my bipeds that all giant dogs are naturally well-behaved because they’ve never seen one that isn’t. My bipeds usually tell them to go and look in the local rescue centre where they’ll find a selection of large boisterous dogs under a year old! It’s great to meet you. I love Newfs! Thank you. The hair is easy to live with, once you get your clothing and furnishings coordinated with it, ha ha! Woooowooooooo, you sound a lot like Malamutes! Yes, I think we have a lot in common!